Imagine sitting across the desk from your doctor receiving the news that you've got oral cancer. It's a scary thought, but one that upwards of 31,000 people have to face every year in the United States alone, according to the American Cancer Society. Approximately 90 percent of those diagnosed with oral cancer or pharyngeal cancer (including cancer of the mouth, tongue, lips, throat, parts for the nose, and larynx) are tobacco users. Tobacco: All forms of tobacco increase a person's risk of oral cancer. In fact, smokers are six times more likely to get an oral cancer than nonsmokers. Alcohol: Heavy, regular alcohol consumption is a risk factor for oral cancer. It's estimated that 75 to 80 percent of those with oral cancer drink alcohol frequently. Like smokers, people who drink a lot of alcohol on a regular basis are also six times more likely to get an oral cancer than nondrinkers. Tobacco and Alcohol: The risk for oral cancer that each substance represents is compounded when they are used together. 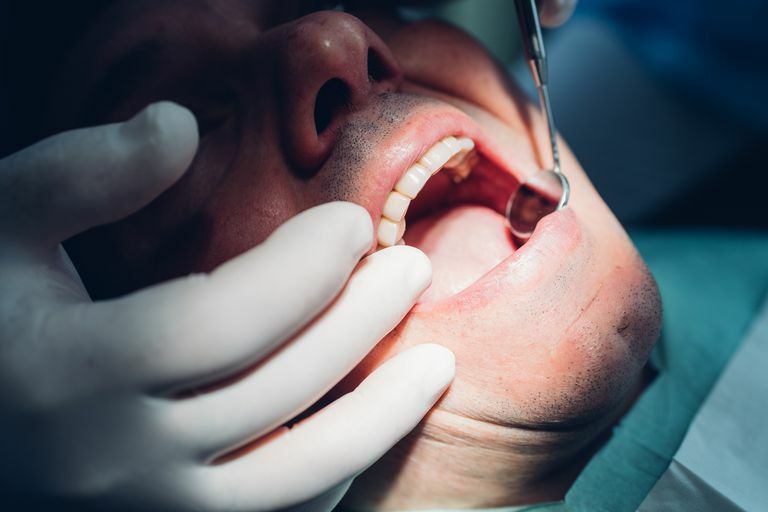 Gender: It appears that men contract oral cancer at twice the rate of women, due to the fact that they are more likely to smoke and drink heavily for longer periods of time than females. Age: After the age of 40, the risk of oral cancer increases, with 60 being the average age of diagnosis. It's important to note that survival rates for oral cancers are 50 percent five years after diagnosis. The earlier oral cancer is detected, the better a person's chances for survival are. Sores in the mouth or on the lips that don't heal and/or bleed easily. A white or red patch of skin in the mouth or under the tongue that doesn't go away. A lump in the mouth, throat, or tongue. A sore throat that doesn't go away within a normal period of time. Swallowing and/or chewing is difficult or painful. If you have any of these symptoms, please see your doctor immediately. Oral cancer screening is a normal part of dental checkups, so visit your dentist on a regular basis to get your teeth cleaned. It's one of the best ways to catch oral cancer early. Most oral cancers could be avoided by not using tobacco and/or drinking heavily. If you fall into this risk category, use the information here as a springboard to help you get serious about quitting. Tobacco is a toxic killer and offers you nothing more than disease and ultimately, death. "FAQ Cancer of the Oral Cavity and Pharynx." NOHSS. 23 May 2006. Centers for Disease Control. "Oral Cancer." 2006. American Cancer Society.